“Being justified freely by his grace through the redemption that is in Christ Jesus: whom God set forth to be a propitiation, through faith, by his blood, to shew his righteousness, because of the passing over of the sins one aforetime, in the forbearance of God; for the shewing, I say, of his righteousness at this present season: that he might himself be just, and the justifier of him that hath faith in Jesus” (Romans 3:24-26). 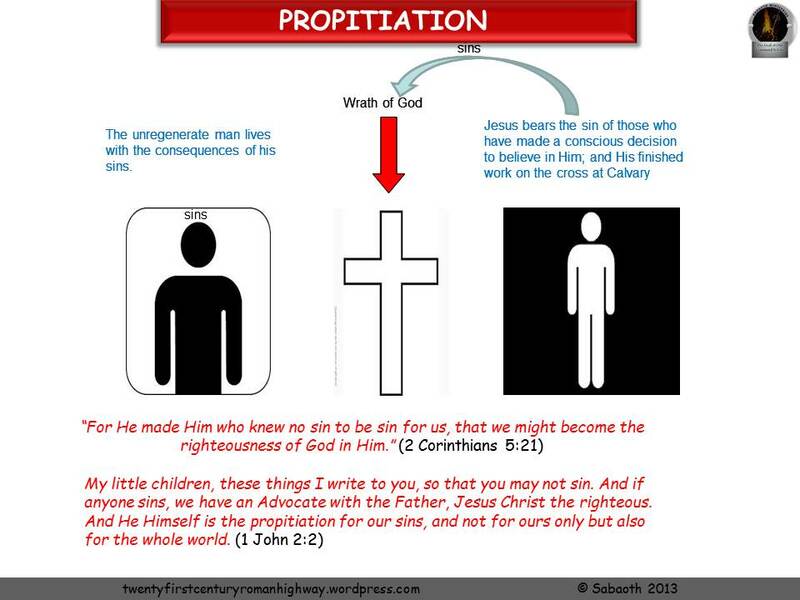 In our look at this very important core of our Christian witness – propitiation, I will like to first of all clarify the relationship between propitiation and atonement as it seems that the two are sometimes being taken to be the same. Using atonement in place of propitiation as seen in some modern versions of the bible renders the death of Christ a perpetual sacrifice which it is not. Propitiation was a one time event. The act of propitiating. Latin propitius, a disposition of favour (one can think pro-pity, a setting forth of pity or mercy). The Greek word translated propitiation in the New Testament is hilasmos, which is a means of appeasing, a conciliation. To appease: to bring peace or calm, to satisfy or relieve. To atone: to make amends or reparations for an injury or wrongdoing, to expiate. 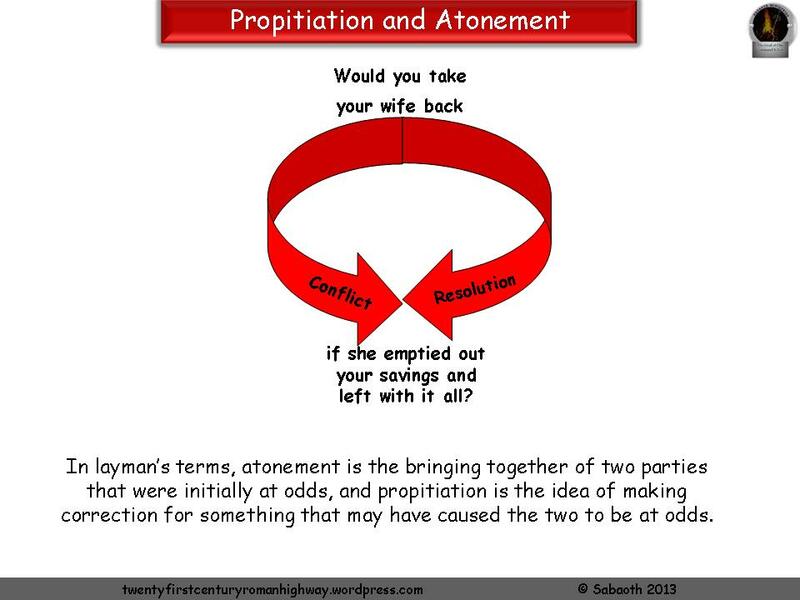 In layman’s terms, atonement is the bringing together of two parties that were initially at odds, and propitiation is the idea of making correction for something that may have caused the two to be at odds. Let us take for example, at the case of a man whose wife empties out his savings and runs away. After a period of separation they decide to settle their disagreement (propitiation) and get back together as one (atonement). In this scenario, bringing the wife and husband together is atonement (reconciliation) and the provision for taking care (appeasement) of the sinful act of the wife (or husband) – the “money problem” is propitiation. I guess one of the first questions here would be “how much of the money has she got left”? And for that question to be asked, the husband and wife have to come together one way or the other. Depending on the state of mind of the husband (or how broke he is), the person resolving this conflict will first of all have to be very well sure that the “money problem” is resolved (Holy God: righteousness, truth and justice) who provided (lamb slain from the foundation of the earth). A comprehensive package that addresses the covetousness of the wife (or as the case may be, the stinginess of the husband and/or other factors that might have caused the situation to occur) must be put in place – these (man’s debt from his sinful nature) are what the Gospel of Jesus Christ addresses through His death, burial, and resurrection. The whole idea here is that, Jesus makes atonement for us by bringing us into fellowship (atonement) with His Father through providing propitiation, which was done by Him dying on the cross to pay the ransom price that our sin demands and that caused us to be at odds with Him who is absolutely righteous. The reconciliation of God and humankind through the sacrificial death of Jesus Christ. Expiate – to put an end to; to extinguish the guilt incurred by. Atonement is a concept in which obstacles to reconciliation with God are removed; through the death and resurrection of our Lord and Saviour, Jesus Christ. In the old testament days, the Ark of the Covenant was the place where the Lord had the sacrificial blood poured out, for the forgiveness of Israel’s sins. The blood was sprinkled on the atonement cover. Man was reconciled to God at Calvary. This was made possible by God sacrificing His only begotten Son Jesus Christ (once and for all) unlike the continual sacrifices made in the old testament. “Who being the brightness of his glory, and the express image of his person, and upholding all things by the word of his power, when he had by himself purged our sins, sat down on the right hand of the Majesty on high.” (Hebrews 1:1-4). One of the strategies of Satan is to make sure that at least he can rob us of our joy if he is unable to steal our salvation by reminding us of our past sins; we will always do ourselves a lot of good to have it in mind that Jesus did not only forgive our “small sins” but “ALL sins”. Propitiation points to what God has received from the death of Christ, whether or not a sinner trusts Jesus Christ. The Holy, Justice, Righteous nature of God has to be completely satisfied and this was done on the cross. Latin propitius, a disposition of favour (one can think pro-pity, a setting forth of pity or mercy). The Greek word translated propitiation in the New Testament is hilasmos, which is a means of appeasing, a conciliation. Propitiation is the work Jesus did on the cross to appease and satisfy God’s wrath so He would be able to pardon sinners who trust in Christ. It is God’s way of making amends for our sins. This He does by a process in which the guilt or innocence is transferred from one person (Jesus) to another (man). The guilt or the bad actions of one person is attributed or imputed to another. So that when it comes to punishment, the person who is the substitute bears the brunt, and that the person substituted goes away free. This way God made reparations for our sins by transferring them to Christ’s account as He hung on the cross at Calvary. The absolute sinless life of Jesus Christ makes this transaction possible as His innocence is transferred to those who believe and follow Him. In our next post please look out for Redemption (Ezekiel 36:25-27) the second component of Regeneration.